I still can't belive it's been a year since I put this webpage on the net. I had been working on it since mid April, and the site was finished...just one thing still needed doing: it needed to be uploaded. Mid afternoon on Christmas day, I had already beat Super Smash Brothers (the original) and was wanting to do some thing else for a while. So I uploaded SOTSS, registered it to many different search engines, and sent a message to ClassicGaming (whom I had been courting for hosting for a couple of days). Hosting was moved, and I quickly was sent into a new host and had everything reuploaded within a week after the true Christmas launch. The old version is still on 100meg's servers, if you'd like to take a gander at the first version and its last update there. Eventually, I destroyed the frames and moved to v2.0 of SOTSS, the dreary (but kinda good looking) version you can look at here. Version three was hot on the tails of v2.0. And, unlike v1 to v2, it only took about a week. However, some of the remaing pices never were changed from black backgrounds untill v4.0 was completed and uploaded. During this first year of SOTSS, I did many different things with the site. 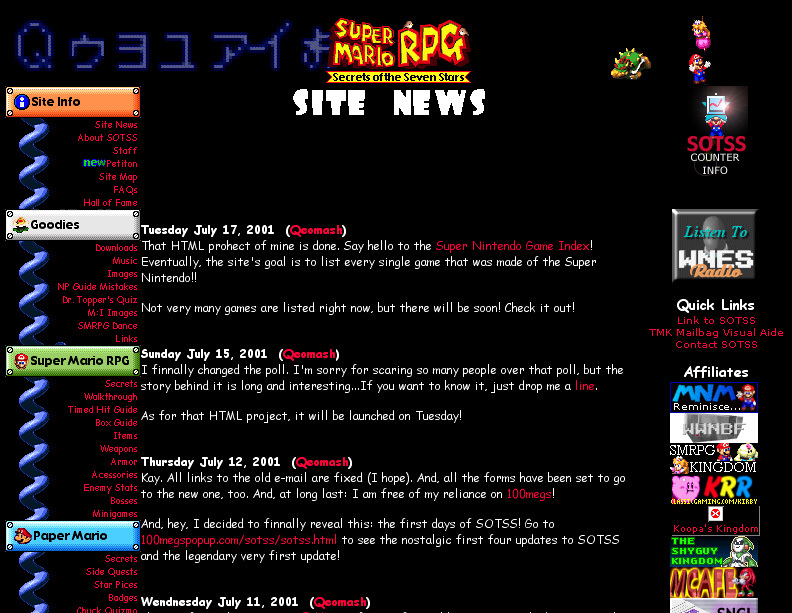 I added a message board, had fanart, and even a Chat Room! I have gotten alot of comments (some good, some bad) and most of the time addressed the bad ones and turned them into good things.